Build the chiller that won the 2004 HauntCon Chill-Off competition. This article appeared in the Make: Halloween issue. Chilled fog creates an appealingly eerie blanket on the ground. Most homemade fog chillers use a drink cooler and PVC tubing, but that design doesn’t keep the fog in the holding area long enough to chill it properly. Our fog chiller is very easy to build and does a great job of cooling the fog. 1. Cut 2 holes in the trash can, on opposite sides, with the hole saw or knife. The holes should be sized so that the dryer hose fits snugly into them. The exit hole goes at the bottom, and the hole for the fogger nozzle goes about 2″ higher on the other side. 2. The aluminum dryer hose comes in 6′ pieces, so attach the 3 sections together using water-resistant duct tape. the upper (fogger nozzle) hole. 4. That’s it for construction! 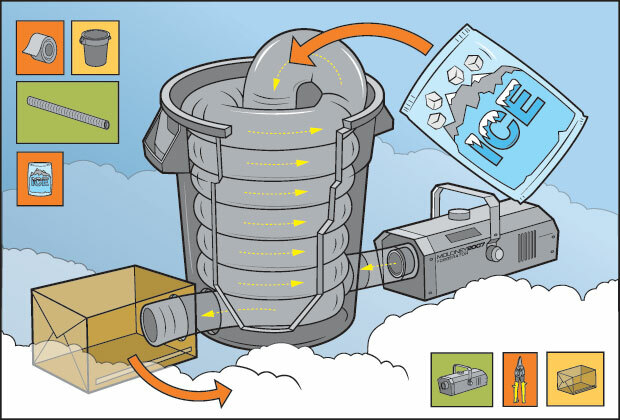 Now, just fill the trash can with ice, attach the fogger, and let’ er rip. NOTE: If you’ve got a powerful fogger, you can cover more area by using a cardboard box with a hole for the output tube and a slit at the bottom for the fog to come out in a wider pattern. Adam Tourkow (ghostsofhalloween.com) lives in Santa Monica, Calif., and is a full-time web developer. He has to borrow his in-laws’ house to run his annual haunted house.